Last week, I was in New York for the Book Blog Unconference and to spend time with other bloggers who were in town for BEA and the BEA Blogger Conference. As always, it was fun to spend time with blogging friends. Somehow, meeting bloggers is easier than meeting other “strangers” because we already have something in common and in many cases we already know a bit about each other. I chose to attend the Book Blog Unconference instead of BEA because even though I enjoyed the Blogger Con last year, I felt that the sessions were too large and general in scope and didn’t provide enough time for bloggers to talk together. The unconference design requires interaction and the participants choose the topics on the day. It was just what I wanted from a blogging event. Plus, it was free, so if it was lame, I could leave without feeling I’d wasted my money. But I’m happy to report it wasn’t lame at all. I could have spent several more hours talking blogging and books with the other bloggers there. About 20 or so bloggers came. (People came and went during the day, so I didn’t get a complete count.) And the bloggers who came represented a variety of segments of the larger blogging community, which I think made the discussions especially rich. 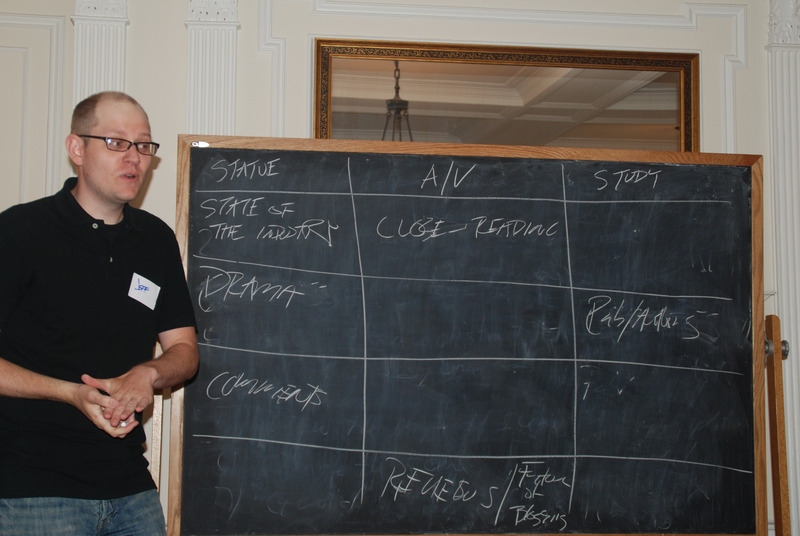 Basically, we began by proposing topics, which Jeff (aka The Reading Ape) added to a chalkboard grid. We discussed which topics should be discussed during each time block. Then, we each marked which session we would attend, just so we could be sure there would be enough people at each session to have a viable discussion. In the end, we only split up for one session and spent the rest of the day in one large group. I’ve already written a bit about the Uncon for the Armchair BEA blog, so if you want to know more about the process and topics discussed take a look at that post. Here, I’d like to share some of my personal reflections on the topics discussed. One of the more interesting discussions to me was about social media. We talked quite a lot about Twitter, which I have a sort of love/hate relationship with. I love the conversations I have, but I sometimes get frustrated by the noise. I didn’t get any new insights here, because most of the suggestions are ones I already use, but it was good to hear that others sometimes struggle with the constant cocktail party that is Twitter. The more interesting and illuminating points for me were related to Facebook. A lot of bloggers I know have created Facebook pages, and I’ve wondered if it would be of value to create one for Shelf Love. But my feelings about Facebook are even more conflicted than my feelings about Twitter. Still, if people are starting to follow more blogs on Facebook, I wouldn’t want to rule out making our blog available there. Some of the bloggers who have Facebook pages said that they’ve found that they get a lot of traffic from Facebook, but that the community itself is different. One person remarked that it’s less intimate than Twitter, and I got the impression that Facebook comments tend to be shorter and less thoughtful than actual blog comments. If any of you have Facebook pages for your blog, has that been your experience? What benefits do you see in having a Facebook page for your blog? One drawback of having a Facebook page was the potential fracturing of comments, with discussions taking place in different venues. One blogger recommended Livefyre as a plug-in that brings all comments together. Since we use WordPress.com, that’s not an option for us, but it does look like a good possibility for others. The first afternoon session, which was on commenting did not bring me anything new, but it did get me thinking about a few things, most notably the possibility of personal attacks in a comments section. Jenny and I are lucky enough to have a wonderful and vibrant commenting community. There have only been a couple of times in four years that I’ve considered deleting a comment that wasn’t obvious spam. In one case, I did delete and in another I just issued a warning. It’s just not been a problem. But I do wonder what would cross the line. We also discussed responding to comments and whether people subscribe to comment replies. Jenny and I try to respond to all comments on recent posts (for me, older ones sometimes get lost in the shuffle), and I like to think that’s one reason our commenting community is so vibrant. I would enjoy it if commenters talked among themselves a little more, just because that’s fun to see, but I can’t figure out a way to make that happen. It just doesn’t seem like part of book blogging commenting culture. 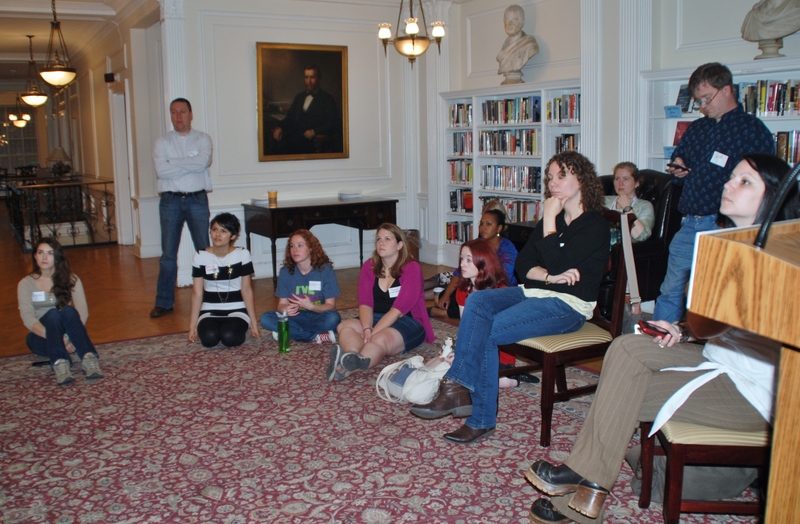 The day ended with a discussion of book reviewing and the future of book blogging. A whole lot of topics came up during this conversation. Someone asked what value there is in reviewing everything we read. I review every book I read because I enjoy the process of putting my thoughts together and deciding why I feel the way I do about a book. One blogger said that she doesn’t review the comfort reads she turns to when stressed or sick because these aren’t books she reads with a critical or analytical lens. That makes a lot of sense to me, but I still find it fun to work out what makes a book an effective comfort read. I’m unlikely to review a book I had already reviewed, unless I have some new insight, and there may come a time when my schedule doesn’t allow me to review everything, but right now, I enjoy the process of writing out and sharing my thoughts too much to stop. And that brings me to the related topic of DNF (did not finish) reviews. Jenny and I both have posted about books we didn’t finish. My general rule is that I’ll post about an abandoned book if I have something to say about it, but most of the time, I don’t bother. I abandon a lot of books because I’m not in the right mood or because they just aren’t interesting to me. I may do a round-up of several DNFs once in a while, but a lot of the time it’s just not worth taking the trouble to write something formal. I do make quick notes in Goodreads of the reasons I abandon a book, but those are largely for my own reference. Some bloggers at the Uncon said they do DNF posts if a book contains content their readers would want to be warned about (such as gratuitous misogynistic violence). I can see that, and I can also see posting about book that’s getting lots of praise all over the place, just to provide an alternate view and a word of possible warning to readers. We also talked a bit about the future of book blogging. We mulled over whether publishers’ attitudes toward bloggers were changing and how that might affect they way people blog. Would some bloggers get more involved with the industry while others cut themselves off from it entirely? Right now, a lot of bloggers exist in a sort of grey zone of accepting a few review copies but also reading from their own shelves and the library. Will that position become more difficult to maintain? When I hear of publicists and publishers acting as if our job is to promote books rather than to critically review them, I get tempted to avoid review copies altogether. But I’ve never actually received any such pressure from publishers, aside from the clumsy letter William Morrow sent out a while back and almost immediately retracted. So since the pressure isn’t coming from the publicists I’ve dealt with, I see no need to cut out review copies entirely, and keeping review copies to under 1/3 of my reading has worked really well for me. So I guess I’m happily living in that grey area and hope it continues to be a viable place to live. Another potential area of change that came up was the possibility that more bloggers will focus more intensely on specific genres. Because I like to read a little bit of everything and most of the blogs I read most faithfully do the same, I’m not sure how likely that is to happen. I do wonder whether the new bloggers who read a little bit of everything will find it harder to establish and build community and thus decide to focus on one thing. One thing that occurred to me throughout the day was how our choices about all of these things will be affected by our own particular purposes for blogging and being on social media. If you’re looking to earn money or make professional contacts, strategies that will bring traffic to your blog or show your knowledge of industry trends might be more important. If you want to advocate for certain books or genres, traffic or a specific focus might be key. If you’re looking for conversation, posting thought-provoking posts and responding to comments might be where you expend your energy. If you want a record of your reading, you might write about everything. If you’re interested in making personal connections, you might regularly go off-topic on your blog or Twitter. All of these choices are valid ones, and it would be wrong to say that someone who chooses to go in one direction over another is not blogging correctly. (Also, it’s perfectly legitimate to focus your blog reading on blogs whose goals and areas of focus that interest you. Choosing blogs to read is not so different from choosing books to read. We’re all going to have preferences in what we like.) One of the great things that I observed at the Uncon was that everyone there seemed to recognize that there are lots of different ways to go about dealing with these issues. Some people had strong opinions, but never once did I get the sense that the participants saw their way as the only right way. Even in areas where there was strong consensus, participants could see reasons why others might make a different choice. When I hear people talk about drama and conflict within the blogging community, experiences like this are heartening. As for myself, I can’t say that I learned anything at the Uncon that will change my blogging practice. I’m really happy with what Jenny and I are doing and see no desire to change. I just enjoy hearing how others think through these issues, and I think it’s important to revisit them now and then. I was going to talk about some of my other New York adventures, but this post is getting epically long, so I just posted some random notes on my Tumblr, and you can see all my pictures on Flickr. I only wish I had more of my blogging friends, because it was great to meet so many bloggers for the first time and to spend time with bloggers I’ve met before. And thanks very much to Jeff and Cassandra, who did a lot of the preliminary work preparing for the Uncon, and to the Center for Fiction, which provided the meeting space free of charge. Part bookstore, part library, and part literary salon, the center is a beautifully bookish space that hosts an impressive array of events. It was a great day, and I hope to see the Uncon become a regular event, perhaps with others held in different cities and at different times. I created one a few months ago, mostly because like you I kept coming across people saying that they find it useful for following blogs these days, but it hasn’t taken off at all. It only got a handful of “likes”, and I never get any comments or traffic from there. Perhaps this has to do with the fact that I haven’t promoted it much at all out of fear of spamming people (I mentioned it once on my blog and that was it). Or maybe it’s because my readers already have established ways of following and don’t need a new one. I know this is unusual, though, and that most bloggers tend to get hundreds of “likes” and plenty of activity there, so I’d love to hear other perspectives. About commenters talking among themselves, I’d love to see more of that too, but the few times it happened people have actually apologised for it. I always clarify that I don’t mind at all, quite the opposite, but the idea that this is not something you should do does seem pretty ingrained in book blogging culture. And I completely agree with this: “All of these choices are valid ones, and it would be wrong to say that someone who chooses to go in one direction over another is not blogging correctly.” Sounds like a great day, and if I ever get the chance to go to New York around the time of BEA I think the Uncon is what I’ll be picking as well. Thanks for sharing your FB experiences, Ana. I remember seeing that you created a page, but I didn’t follow it because I follow your blog elsewhere and don’t like to duplicate. I have a feeling the same would be true for a lot of our readers. That is interesting about people apologizing about talking among themselves. I wonder if there’s a way to make it clear up front that we like when people do that, to encourage them to do it more and to keep them from feeling bad when they do. Culture shifts are hard. I’m not exactly a book blogger (I think 25-35% of my posts are book reviews and the rest are photo posts and travelogues and recipes and just random things my kids do), but I do have a Facebook Page for my blog. It’s where I post additional comments/questions and photos that would clutter my posts. There’s not a great deal of conversation there, and I do find that the comments in the two locations (FB and blog) get fragmented. Some people always comment on the blog and others always comment on the Page. It would be nice if these commenters could chat with each other. I get a lot more spam/troll comments on my FB Page than I do on my blog, which can be a little annoying, but not overwhelming. I do get a lot of traffic from my FB Page, but that’s changing as my blog readership changes and I get more subscribers through WordPress. I also have a Twitter account, but I find Twitter way too overwhelming and time consuming for me. I’ve never found it to be really helpful in supporting my blog, but I can see how that is likely a result of my not investing as much time and effort into my Twitter account as I do my FB Page. Thanks for sharing your impressions of the Uncon. My husband and I were just talking about the unique relationships between bloggers, their readers, and other bloggers. This post lends another dimension to that conversation. Thanks for your insights regarding FB. I hadn’t even thought about spam and trolls, so that’s good to know! I really enjoy Twitter as a place for quick chats with other bloggers or to throw out a quick question, etc. But I think you’re right that it’s all in how much effort you put into it. It’s probably the same with Facebook, and I don’t think I have it in me to put a lot of work into both. Thanks for sharing this wrap-up. I was curious as to how the Book Blog Unconference would work, and I found your post enlightening. I’m sorry I missed it, it sounds like you had some terrific conversations. It was really great. I do wonder how easy it will be to manage if it grows (and it looks like it might). So many things to comment on. I think a niche definitely builds an audience but the audience can remain pretty small. I love my readers, but on recent inspection of my google stats, it appears I only average about 80 views a post. Then again, as Tony mentions above, if I blogged about a niche that is more popular I would probably get higher numbers. I think Twitter and and FB drain energy away from blogs. The more I interact with bloggers on FB(not necessarily those with blogs on FB) the less energy I seem to have to follow up with their actual blogs. I tend to like the personal element of blogs, so if I can get that satisfied on FB, I must admit I don’t follow the blog as closely. The dual conversations you mentioned I think are also a problem. And I know bloggers whose Twittering seems to keep them from actual posting on their blogs. I have been lax in posting reviews of books lately. I know that my reader’s don’t necessarily mind since my non-review posts are always more popular. What is disappointing is that I am no longer keeping a good record of what I read. Yes, I log titles and dates, but I now have a gap in keeping track of what each book was about etc. I think blogging about DNF books is extremely important. It helps set taste and interest parameters for a blogger that helps a reader better understand the context for positive reviews. And one more thing about niches. In some ways my blog writing and blog reading has become a little too niche. I am starting to feel like I don’t know what to read unless it falls under the purview of the cardigan mafia. I have a TBR pile full of cozy, but some times I need something else and I feel too hidebound to trust anyone outside the circle of (reading) trust. You’re probably right that it depends on the niche. It might be easier to get big numbers in something like YA or romance that has a large and established community than in cardigan mafia books. Then again, maybe it’s harder to make an impact within the community. And I think it can be easy to let a niche turn into a rut, which is why I like reading a variety of book blogs. What you say about FB is interesting because I find that I’m more likely to comment on a blog if I “know” the blogger elsewhere too. I did talk with several bloggers during the week who said that doing other online projects besides their blog ended up distracting them from the blog. One person at the Uncon said if he’d discovered Twitter before he started blogging he wouldn’t have started his blog. For me, the two are symbiotic, but the blog takes precedence. Twitter sometimes keeps me from reading, but I’m better at shutting it down than I used to be. Usually if I’m in the mood for Twitter chatter, I’m not in the mood to read and shouldn’t bother trying. Even though we talked about this a lot in NYC, it was nice to read your full recap of the day. I’m still thinking about my own recap, but in seeing what others have said I don’t think I’m alone in being less-than-thrilled with the Con. But what I really wanted to comment on was the idea of niches. My blog has become quite niche-focused, but that’s not because I only read nonfiction. This year it’s been about 60 percent nonfiction, 40 percent everything else. I think I just am known in nonfiction because that’s how I’ve “marketed” and decided to talk about my blog, if that makes sense? I think in some ways it’s easier to be a blogger in a niche because it helps give me some focus when it seems like I could blog about anything. I’ve definitely gotten the impression that your assessment of the Con isn’t unique. Where were the bloggers seems like a common theme. Too bad. That’s a good point about niches. I think Jenny and I know what to blog about because we just blog about what we read and do weekly-ish topical posts. But maybe I guess that in itself is a sort of niche or brand. It’s less of a genre niche and more of a blogging-style niche, if that makes sense. Yeah, I think that does make sense. I think there are ways to be in a niche, or at least have a way to figure out what to blog about, without it being related to genre. That was a really interesting post, with some great comments. I started blogging because I love writing, and was feeling exceedingly sorry for myself at the time.Silly though it sounds, the possibility of people reading it, let alone responding, didn’t dawn on me at all to start with. I love the feedback when people comment, and try to reply to each one individually, because it shows my appreciation – but I’ve never been sure if there is some kind of etiquette involved. Am I supposed to do this? And is it OK to reply to a comment and start a dialogue, or would that be rude, because it’s like hi-jacking the main post? I wouldn’t want to be tied to a niche, but as far as books go there are lots of genres that I don’t read, so I suppose that in itself creates a niche, albeit an unintentional one. Like Thomas, I find I get larger responses to non-book items on the book blog (and they tend to get a bigger readership). But that doesn’t really surprise me. When I was reporting and subbing, stories that provoked the most interest, and brought in lots of letters, were often the less serious and less important items. I think the non-book stuff gets more responses because more people can relate to it. It’s not always easy to comment on a review of a book you haven’t read. I know just what you mean, too, about not thinking about people reading and commenting when you got started. I did think a little about it, but I didn’t imagine we’d have such a large a lively commenting community. I mostly just looked at the blog as a way to keep track of my reading and a way to stay in touch with Jenny about our reading. As far as replying to comments, I don’t think there is a defined etiquette. I like it when bloggers either reply to my comments or interact in some way, either by visiting my blog and commenting or tweeting my post or something, just so I know I’m not talking into a vacuum. And I can’t speak for others, but I would love for commenters to reply to each other’s comments. To me, it would only seem rude if a commenter tried to take over the comments section by replying to everything. Tony, whaddaya mean, no niche? You’re a classics blogger, like me? Isn’t that the category in which we both suffered a crushing Book Blogger Appreciation Week defeat last fall? I may be wrong. It was so traumatic I have suppressed the memory. Classrooms have the same problem – why is every interaction teacher-to-student? When the students start talking to each other – arguing, supporting, whatever – you know the class is really going somewhere. My bloggish ideal is the graduate seminar. We are all sitting around the table, everyone takes the material seriously, everyone has thick skin, and every idea is scrutinized by everyone. I’ve gotten close to this on occasion. I have a prejudice against the “Reply” button. I think it generally diminishes open conversation and reinforces the teacher-to-student, blogger-to-commenter dynamic. Twitter, I forgot Twitter. As you have likely seen, I use Twitter as promotion, but not just of myself, but other bloggers. That is the #1 benefit of it to me, using it to plug exciting writing by other bloggers. And I still have flashbacks to last September – the screams of the lambs haunt my dreams (wait, maybe that was something else…). The great advantage of the Reply button is shown by the way you use it – the valuable personal response. It is also not bad for minor points of information – corrections or additions on some factual issue, or recommendations of related books, or something like that. The new information is slotted in the right place, rather than showing up halfway down the comment stream. If this thread is any indication it looks like if you say you want commenters to talk to each other, at least a few will comply. (Thanks, Tony and Tom!) I’m thinking if that’s something lots of us want, we could all just make a point of doing it more, at least on each other’s blogs. We could start a trend! I like to reply to other comments, but on some blogs I worry that the blog owner won’t like me jumping in. Perhaps those of us who want a seminar-like discussion should find a way to encourage discussion? I’m not sure what it would be, though. A great, great post. Thank you for sharing. I got on Facebook long before I started blogging it mainly for getting to socialise with friends. Now, though my posts automatically get to my FB page, comments there are few, since almost all my followers/friends come over to my blog to comment. When I got on to twitter, i realised that I preferred that to the FB, so I’m found most of the time on twitter than on FB. I also love it when commenters talks and hat amongs themselves becasue I believe that gives the whole blogging thing a human and more intimate value. At the same time, I do realise that some commenters are shy/private and would not want to reveal much or more than necessary. I was on FB before I started blogging, too, and I also have my blog posts fed automatically to my personal FB page because some family members asked for it. Once in a while someone will comment there, and I do like that, but it’s mostly only people I know in “real life” who see it there. And I agree I wouldn’t want readers to feel pressured to comment. I read lots of blogs without commenting. This is a wonderful write-up Teresa and I really appreciate your feedback on the UnCon. I’m not sure I’ll ever make it up to to NY during BEA (BEA itself doesn’t interest me as I do read more from my shelves than from the mailbox), but if I do I think this is the conference I would love to attend. I do think it’s important to have a variety of ideas of what makes blogging fun and successful and it sounds like the forum was a very supportive one. It’s been fascinating to watch the community evolve over the past five years and I’ll be very curious what direction it takes. I see a lot of newer bloggers gravitating towards one genre (or focus) rather than the variety that makes me love reading the blogs that I do. But as a blogger who has branched out beyond books I realize how difficult it is to build an audience when you’re all over the place. I do hope to continue to see bloggers reading from the shelves as there is SO much outside of the world of ARCs. It has been interesting to watch the community change and grow, and as with all changes, there’s a mix of good and bad. More and more lately, I’m seeing bloggers turning back to their shelves for their reading, which makes me happy. Is that true, that a substantial number of book bloggers read nothing but review copies? How horrible – like a diet of nothing but airline food. I think review copies are a prize for a lot of people, and they talk them up as much as they can to keep the stream coming. If you look at some of the weekly mailbox memes, you’ll see lots of people getting more review copies than they could possibly read. Maybe they read other stuff too. I only follow a couple of blogs that do those memes regularly, so I couldn’t say. 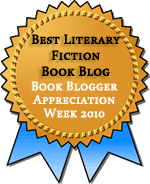 Then there’s this post (http://www.chrisbookarama.com/2012/06/armchair-bea-heres-tip.html) in which Chris says she’s seen people express surprise that they could review older books for their blogs. Boggles the mind. Wow, Chris provides a glimpse into the abyss. On the other hand, that dancing cat was very impressive. Wuthering Expectations would not be harmed by a few more dancing cats. But seriously, only new books? Tom, if I could get my cat to dance like that–and in front of a camera!–you can be sure I’d find a way to use it. And Tony, I think it should be a new book-blogging rule that anyone who thinks they can only review new books be directed forthwith to Tom’s blog. Exploding brains everywhere! Excellent wrap-up! I keep going back and forth on even creating a Facebook account, much less a page for my blog. I know everyone and their mother is on fb, and I feel like I *should* have a page for my blog, but I really don’t want to go over to the dark side just yet (or ever). As for Google+…ugh. I created a profile ages ago, but quickly deleted it because G+ looked stupid and useless, like a low-rent Facebook (and I’m already annoyed by fb, so…yeah). This weekend I went back and decided to give it another try. I created a G+ page for my blog, but I don’t really expect much from it (and frankly, G+ still looks stupid and useless). I have been blogging for 6 years now and I have noticed a huge difference from back in 2008 to today. I think I started blogging just a little before it became every man for himself so to speak. Back then things were so much easier and there was really no pressure. I was surprised at how fast I would get contacted to review books and now its virtually impossible to get accepted for anything with publishers. Not many US publishers want to send physical books to Canada and Canadian publishers just don’t have budgets like the US does. I admit that I do review a mix of review books with my own when I get the chance. I have never attend the Blogger Con at BEA only because I felt like that first year it wasn’t geared towards me since i had been blogging awhile and I just feel as though Reed has changed the con too much for me even wanting to go. thanks for sharing your recap and I am seriously thinking if you guys do it again I would love to attend.